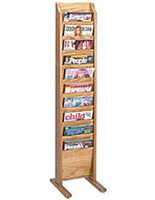 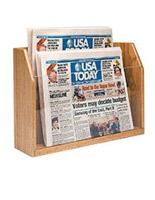 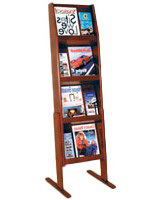 This freestanding wooden literature stand has 4 shelves that are 1.3” deep to hold thicker catalogs or periodicals. 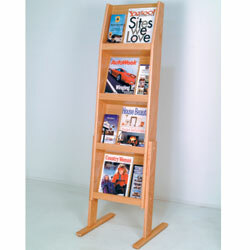 The magazine rack is made of solid oak with an open shelf design so that a combination of brochures and booklets can be stored on the holder. 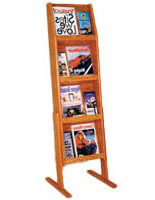 The literature stand with compact structure is able to take up a small amount of space near any wall or corner it is placed. 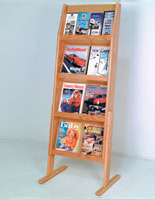 The magazine rack is finished in light oak and will look great in many interior design combinations. 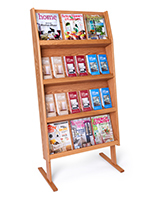 The stand is able to store 3 brochures side-by-side or a single pamphlet and periodical pairing on each shelf. 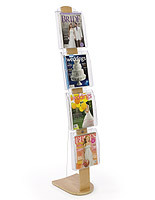 The holder has no panels on the front to keep materials in place and so is best used with bound or more rigid informational sheets. 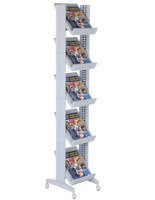 15.0" x 49.0" x 4.8"
13.5" x 11.5" x 1.3"